"Why are we fighting this war? Because evil must be resisted, and sooner or later there comes a time when men of principle have to make a stand. Because war is good for business and it's better to die on our feet than live on our knees. Because they started it. But at this stage in the proceedings," he added, with a slightly lop-sided grin, "mostly from force of habit." A soldier with a gift for archery. A woman who kills without care. Two brothers, both unbeatable generals, now fighting for opposing armies. No one in the vast and once glorious United Empire remains untouched by the rift between East and West, and the war has been fought for as long as anyone can remember. Some still survive who know how it was started, but no one knows how it will end. This serial novel from the World Fantasy Award winning K. J. Parker is the story of a war on a grand scale, told through the eyes of its soldiers, politicians, victims and heroes. The first three parts of The Two of Swords will arrive in April 2015, with further installments to be released monthly. 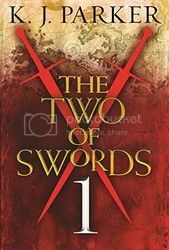 This is the first installment in the Two of Swords serialization. This novella is the first part of a series of novellas telling a connected story about a war, told from the varying viewpoints of different characters (I'm under the impression that these viewpoints will be like from soldiers (of both sides of the war), town folk, kings, etc.). The other thing that is supposed to be unique about this story is that the author hasn't actually finished it yet. He knows where he wants it to end, but hasn't planned everything out exactly, so things could change as he proceeds with the writing (he says it's like he's actually writing history as he progresses with the story). Needless to say, I won't be downloading any of the subsequent parts (this is being released solely as eBook editions, with a print version released when the story is completed). I could tell if the opening segments were meant to be funny or not, and the following segments, told from the point of view of a conscripted farmer, Teucer, who is well-known for his archery skills, are nothing more than a travelogue of the hardships that Teucer and the rest of his regiment have to endure, trying to get to the battle. I felt no connection or concern for the characters, didn't care whether they lived or died, and really don't care what happens next. The writing is decent, but it honestly feels like Parker just sat down one night, wrote this out, and published it. The change in tone from the opening segment to the rest of the story is jarring and doesn't feel like it's even supposed to be connected. Maybe if this read like it had been polished a little more before it was published, I'd feel a little different about it, but as it stands, I won't be continuing with the series. I really loved this book. Unfortunately it wasn't long enough but I still can't wait to read the next book. A great read.